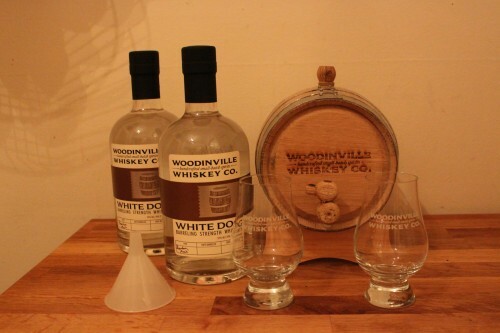 Woodinville Whiskey Company is a small-batch distillery out of Washington state producing bourbon (with a rye on the way), white dog, and surprisingly enough, vodka. They also offer what I believe is the first all-in-one home barreling kit. Included are a 2L chard oak barrel; two fifths of 110 proof, barreling strength bourbon mash white whiskey; a funnel and two tasting glasses. It also came with a handy little booklet that explains the whole process. The barrel comes dry and will leak. The first thing you do is fill the barrel with hot water and let it sit for a couple days. Periodically top it off to replace what has dripped out. This causes the wood to swell, filling any tiny gaps. 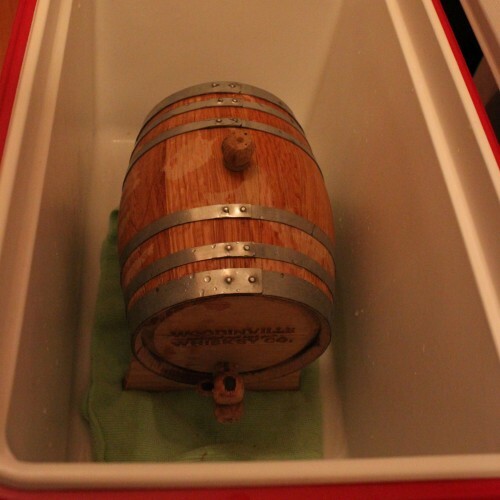 Here you can see our barrel (sitting in a cooler to catch the spillage). Very soon this little guy will be ready to fill with whiskey! Be sure to check back later this week for our tasting notes on the un-aged, 110 proof white dog.